I use it with a 5D3 and any combo of Sony wireless lavs, an Azden and Sennheiser shotgun mics. Very little detectable hiss. I use a rechargeable lithium 9v, I love this thing. It can even be mounted underneath a shoulder mount rig. Nice job with this video. Very informative. I really liked your comparison at the end of the video with the camera mic, the shot gun mic and the shot gun plugged into the Beach Tek. Good review. Funny how you're wearing a blazer and different sweater in the closeup shots! Cracks me up!! @Danny Schmidt - AGC automatically boosts the amp inside the camera. This is where you hear a 'hissing' noise when you are recording something that is fairly quiet. With manual audio levels (60D has this option), you would forcefully turn down the amp inside the camera, and then use an external amp that doesn't provide the 'hiss'. 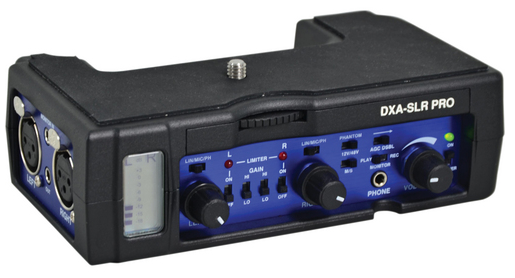 Many microphones on the market require an Amp to get the best sound from it. Using the camera amp will work, but it will never be as good as using a better preamp into the camera. Or just use a Zoom H4n separately because it has decent amps. I am with Patrick. What's with the wierd monitoring wiring? That many wires turns into a spaghetti mess, not to mention the added possibility of accidentally unplugging that awful USB plug. It looks like a great unit minus the monitoring malarkey. Hopefully the Juiced Link follows in form factor. I would rather support him. A convenient way to monitor and use balanced audio inputs. Emm, so the 60D does not have AGC? Do you get good audio in your 60D going straight into the mic input vs the 7D? I didn't know there was a difference between the 60D and the t2i/7D. i really dislike the "handgip" style especially when ist is not as smooth as an battery grip. i really have concerns putting this under the cam an then the whole combination an a rig or tripod. i would whish more an more flexible mounting options on the device. I,m very new to external audio recording. I just bought a h4n because I got a good deal on CG. I have known about the dt454 for a while, but after watching this video, I'm confused. Once I buy one. Do I still need to record audio externally since my camera will be able to capture audio on board cleanly? When I use it with my 7d with AGC disable on, will I be recording in mono since it produces a tone on the left side to lower the noise floor? Or can I connect two xlr mics and record to both channels? 7d with Rode video mic pro directly into mic port. H4n set to 4 channel mode. Sennheiser g2 ew100 using supplied 1/8 to xlr adapter into xlr port left. Where would this beachtek pro or a DT454 fit in the above config? I own the dt454 and it's great, but I like the solid build of the Beachtek, looks more professional. Why do you have to do all those connections to monitor? shouldnt it just connect the XLR in to the phone jack? and plugging that in like that to the camera doesnt that screw up the live preview making it think its being used externally? Also i wish it had an XLR out as well to record to my H4N so if it does compress it to much i can match it with my H4N. @Chaz Rough - I have not used the new BeachTek Pro, but they offer the same features. Meters, headphone monitoring, AGC, XLR inputs, Phantom Power, etc. etc. Do you think the Beachtek Pro is better than the Juiced Link dt454?